Thank you to all attendees, presenters, sponsors, organizers, volunteers, and contributors for joining us and bringing your experiences to share at our annual conference, Cultivating Community. Special thanks to our presenting sponsor, Columbia Basin Trust, and our host markets, Kimberley Farmers’ Market and the Cranbrook Farmers’ Market. 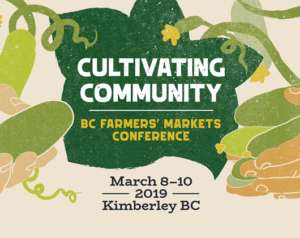 We hope you enjoyed the conference and are inspired to take on the 2019 farmers’ market season in full swing! We look forward to seeing you in 2020! The BCAFM acknowledges that the 2019 Conference was held in Ktunaxa Nation. As visitors to this land, we thank our hosts for their hospitality, and recognize that it is on their land where we work, live and play, and where the food that sustains us grows. Congratulations to all nominees and winners of the 2018 BC Farmers' Market Awards.